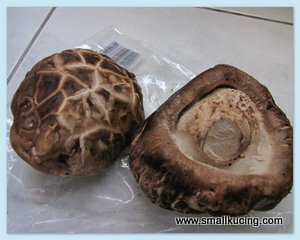 Mamarazzi went to Pasar Malam and saw that these fresh mushroom being sold very cheap. RM2 a packet. She bought a packet home. She was not sure how to cook these mushroom so she simply 'hentam'. Chopped some garlic, a few pieces of Chicken Meat and sliced two pieces of mushroom. Stir-fried them with Dark Soya sauce and Oyster sauce. Mmmmm....the aroma itself is good enough to tempt me out of my hiding place. Yummy...must ask Mamarazzi to cook some more soon. yup .. that is one of my fav food..
hello mamarazzi, miss u!! long time didn't dropped by your blog, :( busy lately blog pun tak update now only ada time ronda - ronda your blog. 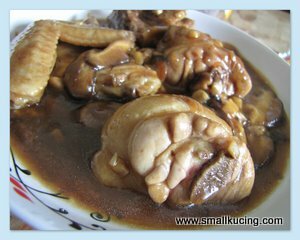 I hope your keepin well in a good condition he he he..
By the way the mushroom chicken looks fantabolous!!! wanna try that recipe sometime. Easy peasy recipe... Chinese cuisine. Long time MI did not visit your blog Small Kucing. Myyy...that dish sure looks delicious otherwise you wouldn't ask mamarazzi to cook it again ah? Yes these dry mushrooms is also MI's favourite mushrooms. Any dish you add it with will gives the soup some sweet taste. I like this dish but normally I add some dried red chillies inside. simple meal n delicious...I love cooking this dishes,normally i added some potatoes in.